I don’t think there’s ever been anything quite like this. It’s a love story, it’s a mystery, and it’s also the most thorough explanation of Chinese food that I’ve ever read in the English language. The perfect leisure read. 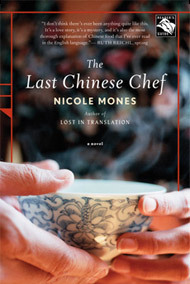 Effortlessly weaves together a fast-paced romantic plot with profound precepts from ancient Chinese food culture…Delicious. A stunning picture of a country caught between tradition and modern life.